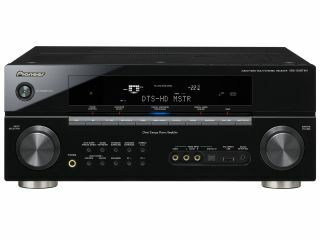 Pioneer revealed four budget home cinema receivers at CES 2008 today, but there's only one model that'll really pique your interest. That's because the VSX-1018TXH-K is the only one to include seven discrete audio channels and built-in Dolby TrueHD, Dolby Digital Plus and DTS-HD decoders so you can get the most from the soundtracks on today's HD DVD and Blu-ray movies. The VSX-1018TXH-K also includes HDMI v1.3 ports for the best possible picture quality too. The 7 x 130W channel amp could be yours for just $599 (£303) when it goes on sale in June, two months after its less well-specified, 5.1-channel siblings - the VSX-518 ($199/£101), VSX-818 ($249/£126) and VSX-981 ($349/£177). No matter. All four models include a range of proprietary Pioneer technologies that should give you the excellent performance per pound. These include Multi-Channel Acoustic Calibration (MCACC) which enables you to tune your system's sound to suit your room, plus Auto Level Control which equalises sound levels from different sources (CD, MP3, etc) to save you from constantly tweaking the volume level. You'll be able to find more about each receiver on the Pioneer's CES 2008 webpage tomorrow.